All SCGI students have to comply with the University Regulations. Dismiss students according to the following situations: After classification, the student has a Cumulative GPA of less than 2.5. The student has enrolled in the same course for the third time, and has still not passed the course. The student has been studying twice the time specified in the curriculum, which includes leave of absence if taken. The student has breached the University’s or joint institute regulations on students’ discipline. The student has difficulty studying or otherwise due to a mental disorder. In this case, the university will appoint a committee to deliberate on the situation and make recommendations for the Academic committee to approve. The student is caught cheating during an exam and the Academic committee decides to dismiss the student. Academic dishonesty is prohibited at SCGI. It is a serious offense because it diminishes the quality of scholarship and makes accurate evaluation of student progress impossible. Academic dishonesty includes, but is not limited to, the following categories. Altering the record of experimental procedures, data or their results. Altering the record of or reporting false information about internship, clinical or practicum experiences. Forging someone’s signature or identification on an academic record. Multiple submissions of substantial portions of the same academic work, including oral reports, for credit more than once without prior authorization by the lecturer involved. Submitting as one’s own paper a paper written by another person or by a commercial ghost writing service. Exactly reproducing someone else’s work without identifying the words with quotation marks or by appropriate indentation or without citing the quotation or referencing. Paraphrasing or summarizing someone else’s work without acknowledging the source with a citation or reference. Using facts, data, graphs, charts or other information without acknowledging the source with a citation or reference. Cutting and pasting information from electronic sources without acknowledging the source with a citation or reference. 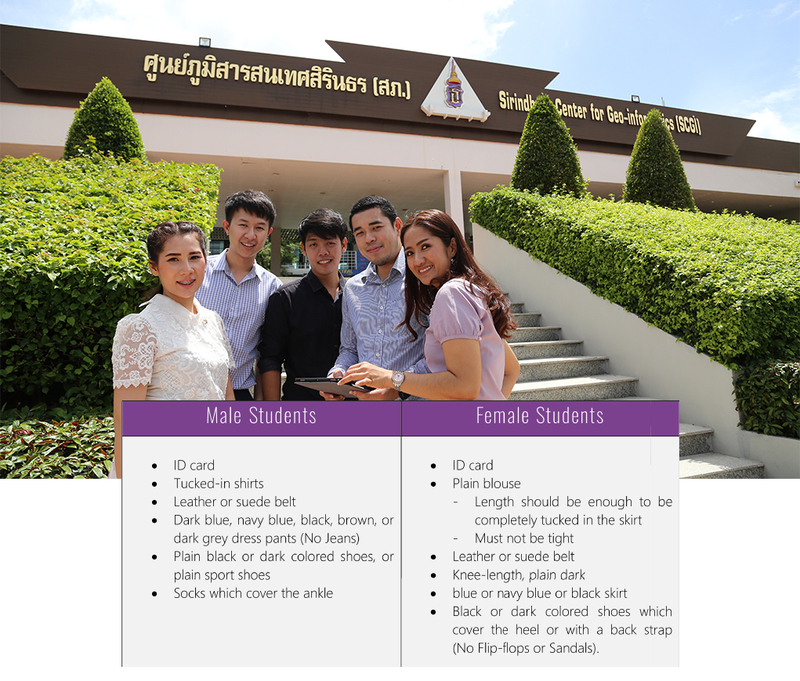 Students are required to wear proper attire while at SCGI, especially when in class and during examinations. Students are required to have at least 80 percent class attendance to be eligible to take the final examination. As a courtesy, students need to let the instructor know beforehand when they have a valid reason to leave class early or come to class late. Permission from the instructor is required to leave a device on in an emergency. Students are not allowed to bring food or drinks in the classrooms. Smoking is prohibited everywhere on campus. Students must present their ID cards every time they take examinations. Students must wear proper attire according to SCGI’s regulations; those wearing jeans, short skirts, sandals and / or shoes with no back strap will not be allowed to enter the examination room. Students are prohibited from using another person as a substitute in taking an examination and / or acting as a substitute for another student at the examination. Only students on the official registration list are eligible to take examinations. Students are allowed to keep necessary examination accessories near them, such as pens, pencils and valuables. Students must not keep mobile phones, communication devices and / or electronic recorders of any type on their person during the examination. Students must not bring textbooks, notes, documents, calculators or any objects that contain formulas, texts or symbols related to the examination into the examination room unless uthorized and clearly indicated by the lecturer. When dictionaries or other reference materials are allowed during the examination, proctor will check them. Electronic dictionaries are not allowed. Students are not allowed to talk during the examination. If there are questions, they should be directed to the lecturer or to the proctor. Students are not allowed to copy, take pictures of, tear or take the examination paper, answer book and / or answer sheet out of the examination room. Students are not allowed to send any information via email or other electronic devices during the examination. Students who are suspected of cheating, caught cheating or are involved in any cheating must be subjected to disciplinary procedures and their penalties. Students who fail to take an examination on the date and time scheduledby SCGI will be considered absent from the examination and automatically receive an F, except for those students who receive approval to take the make - up examination or receive prior permission before the examination date; such students will be given of “I” until the “I” is changed to letter grade. Using or attempting to use books, notes, study aids, calculators, computers, papers, electronic devices, electronic files, electronic means or any other documents without prior authorization by the instructor during the examination. Possessing written notes on body parts, paper or other objects during examination. Sending an examination paper and/or answer sheet via email or any other electronic media during the examination. Signing the examination attendance sheet certifies that you have read the above information and agree to all the rules. Therefore, you consent to accept any punishment according to the SCGI Examination Rules. The decision to investigate any violations is at the discretion of the Academic committee. All essays, projects, thesis and thematic papers must be the student’s own original work. Plagiarism could lead to the aforementioned punishments. Students are required to wear proper attire while at SCGI and LIESMARS. The SCGI Code of Student Conduct contains SCGI’s policy regarding the discipline of its students. It is meant to protect and preserve the educational environment on various campuses. The committee reserves the right to take any necessary action to protect the safety and well-being of the campus community. Violation of Laws and of this Code Students may be accountable to both civil authorities and to the program for any illegal activity, such as assault, theft, possession of illegal substances, disorderly conduct and so forth. The committee will refer matters to the proper civil authorities. Students must regularly and strictly observe the regulations of the Code of Conduct. Any non-ethical conduct, which is considered a disciplinary offense, is subject to the actions stipulated in these regulations. Students are expected to maintain the unity, peace, reputation and honor of the program. Students must conduct themselves in a manner, which does not cause disrepute or damage to oneself, other persons or the program. Students must dress appropriately, in accordance with the regulations and notifications of the university. Students shall not drink alcohol or intoxicants on the university campuses. Gambling or engaging in any activity that promotes gambling. Consuming or having in one’s possession narcotics or illegal drugs for either personal use or distribution. Theft, fraud, embezzlement or exerting undue coercion in financial transactions. Possessing or carrying firearms or other dangerous materials on campus, which may cause danger to the lives and property of others. Sexual activity that violates public sensibilities or sexual assault. Physical assault on others that may result in serious injury or death. Committing any criminal offence that may result in imprisonment. Intentionally cheating on examinations or attempting to do so. Forging the signatures of others and forging documents or amending any content and using the same as evidence, all of which may cause damage to the college, university and others. Purposely destroying the property of the university or of others, which may cause serious damage. Conducting any other actions deemed as a serious breach of discipline. Written warning to parents who are invited to sign the warning and acknowledge the student’s breach of discipline. Any cases not mentioned in these regulations will be submitted for consideration by the Academic committee. The student has committed a criminal offense, which is the responsibility of the courts and legal system. The student has committed a disciplinary offense and confessed as much in a written statement or a verbal statement to the Academic committee. The appellant must submit a written and signed appeal, which can be submitted personally; it is prohibited to assign another person to appeal on one’s behalf. The student wishing to appeal is entitled to see the investigative report. However, the inclusion of witness statements may be withheld, depending on the discretion of the Head of the Committee. The Committee must consist of at least five persons and not more than seven. Consider and make judgments on all appeal matters. Issue written orders summoning any person to give statements or deliver documents or materials to support any appeal. Appoint members or groups of members to consider appeals or take action within the scope of the Committee’s powers. An appeal against any order for punishment shall be submitted to the Committee within 15 days from the acknowledged date of the punishment. The written appeal letter must be directly submitted to the Committee, which will make a judgment within 30 days from the date on which the appeal was received. An extension of time may be granted, provided it is recorded as evidence, and shall not exceed 60 days. If the Committee decides that the punishment order is appropriate to the offense or that the punishment is unsuitable and unfair, the Committee either dismiss the appeal or move for acquittal, whatever the case may be. Any such decision shall be regarded as final and the Committee shall transmit its written decision to the appellant. Regarding the period stipulated in these regulations, should any deadline fall on a national holiday, the following workday shall be counted as the last day of the prescribed period. The head of the committee is responsible for the implementation of these regulations. If there is any problem regarding compliance with these regulations, the head of the committee is empowered to finalize any orders.